Multi-colored tourmaline is a variety of tourmaline containing two or more colors displayed in one crystal. Green and pink is the most prevalent combination, but others are possible. 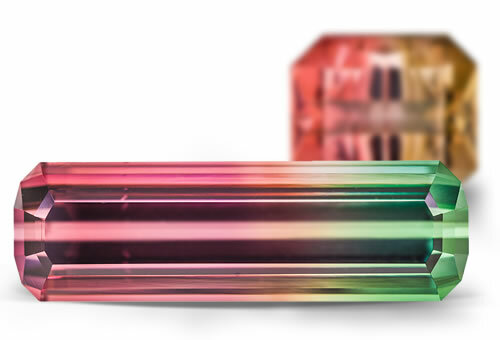 Multi-colored tourmaline may be referred to as "bi-colored tourmaline" or "tri-colored tourmaline," etc. Not all multi-colored tourmaline is elbaite tourmaline Na(Li1.5Al1.5)Al6(Si6O18)(BO3)3(OH)3(OH).Dark material might have a birefringence as high as 0.040.Pyroelectric: development of opposite charges at the ends of a tourmaline crystal due to change in temperature. Piezoelectric: development of opposite charges at the ends of a tourmaline crystal when placed under stress. Multi-colored tourmaline is Type II clarity stone. Stones will have two or more color zones. Stones might contain liquid and gas inclusions that are long and thin, reflective gas-filled fractures and color zoning.